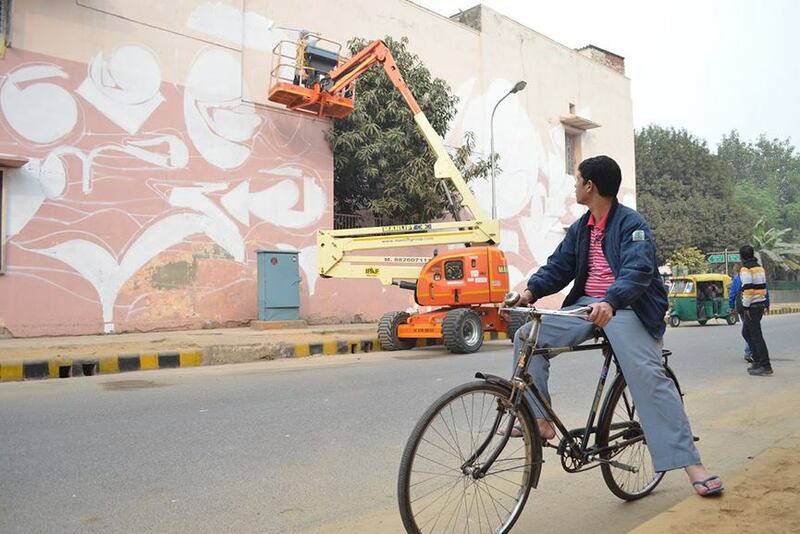 St+ART India is a Delhi-based art foundation, dedicated to the development and promotion of street art. 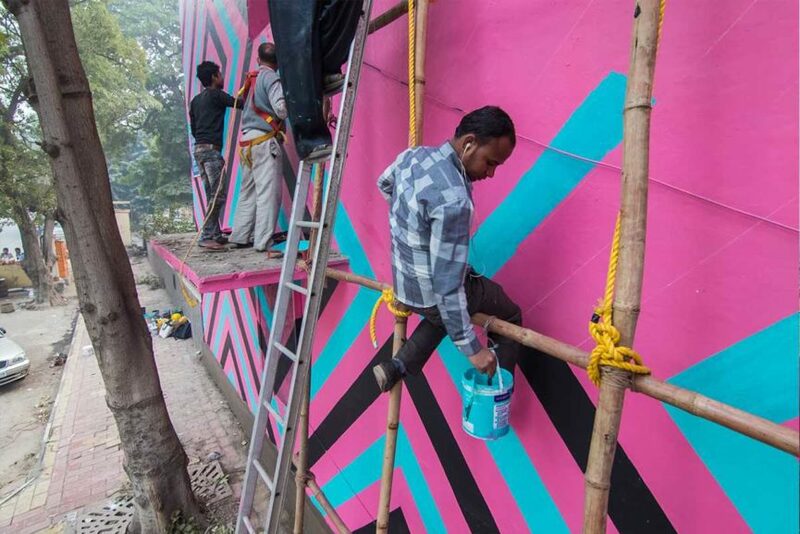 In December 2015, a street art festival called St+ART Delhi, supported by Asian Paints, took place in two locations in Delhi. 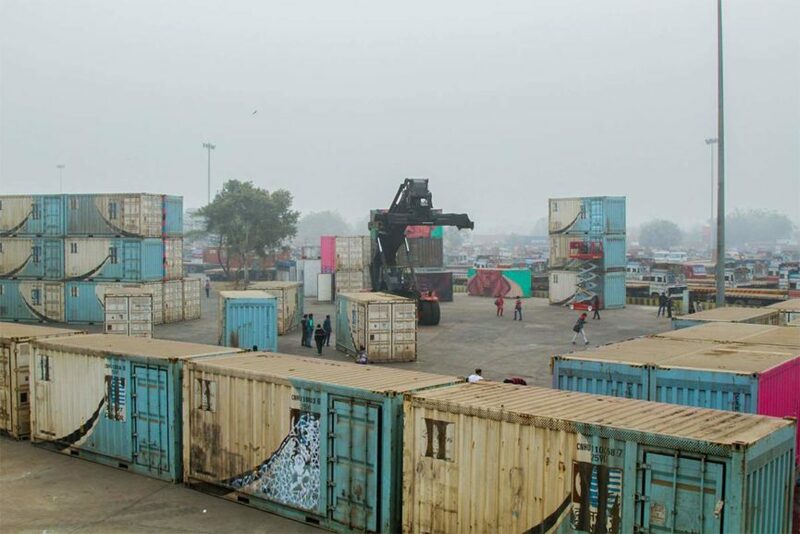 The first one is Lodhi Art District, and the second is a very interesting brownfield of the city – the Inland Container Depot (ICD) in Tughlakabad. The main idea of the project is to re-shape parts of the urban identity of the city. 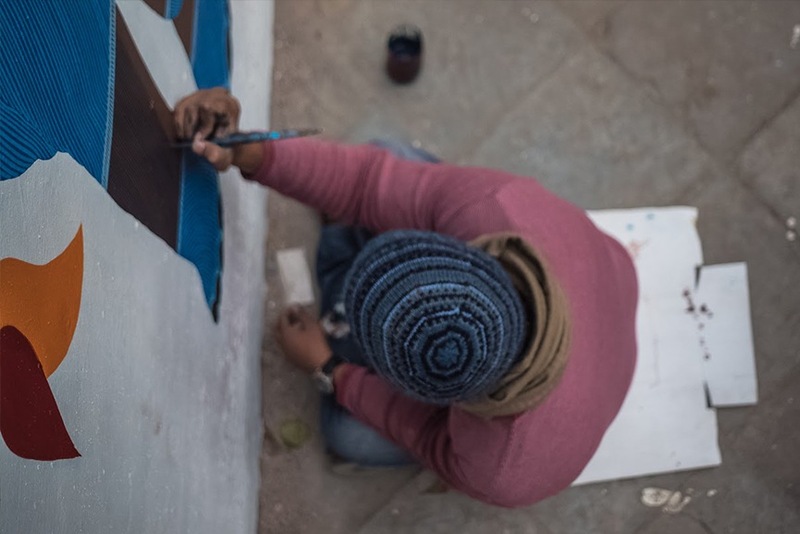 The colorful India has so much to offer to both its locals and the tourists, but at the same time the dusty old walls serve as perfect platforms for an admirable range of street artists, who come from all parts of the world, to easily express themselves. 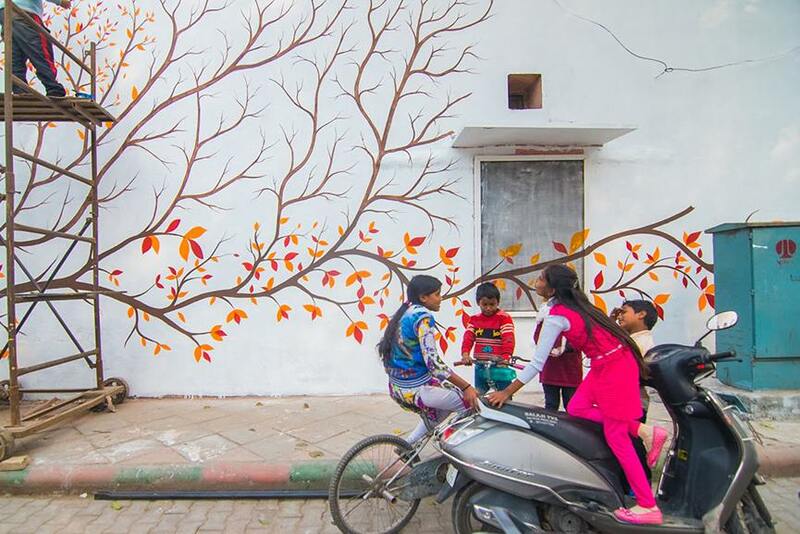 These walls, combined with the vibrant nature that surrounds them, were certainly inspirational to the whole group. However, the second part of the festival, whose title is Work In Progress, is still ongoing, and is possibly even more interesting than the first one. 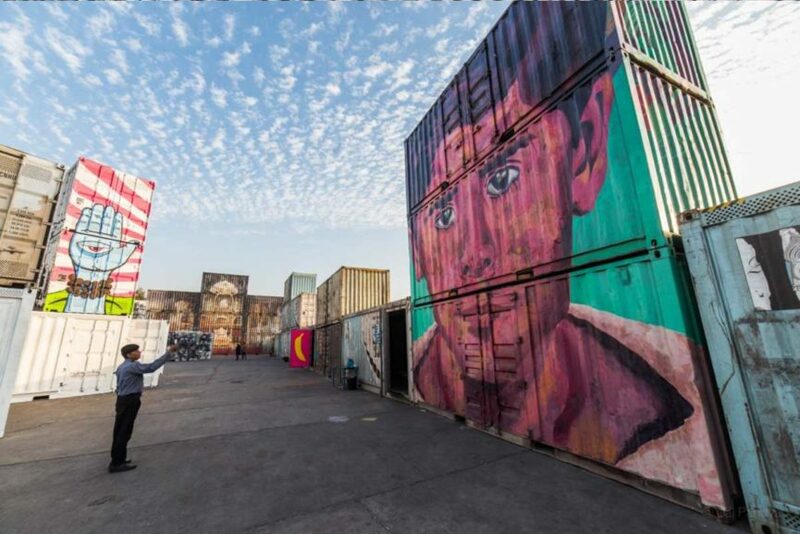 The Work In Progress (WIP) Show features amazing site-specific murals that are represented on shipping containers at aforementioned ICD. 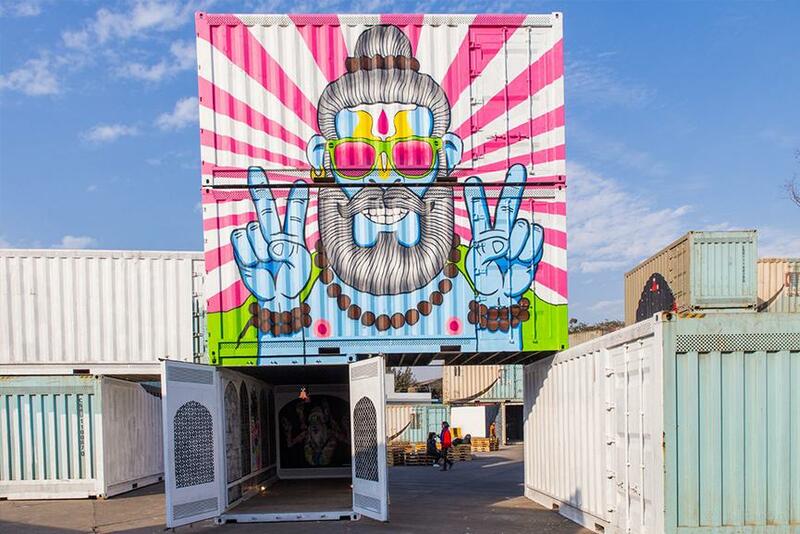 Around 100 shipping containers were used, and the whole project is described as a “larger than life” walk-through installation. The scenic atmosphere is still being created by the talented, prolific artists and the curators of St+ART Foundation, and the show runs until February 28th. In the meantime, if you happen to be in Delhi, be sure to visit this amazing venue. 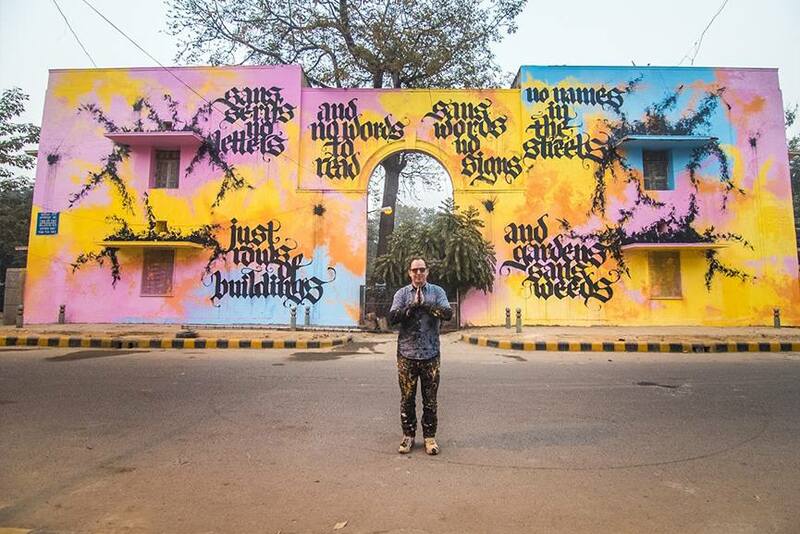 And in case you aren’t able to visit India, here is a list of 10 beautiful murals that were created for the show. 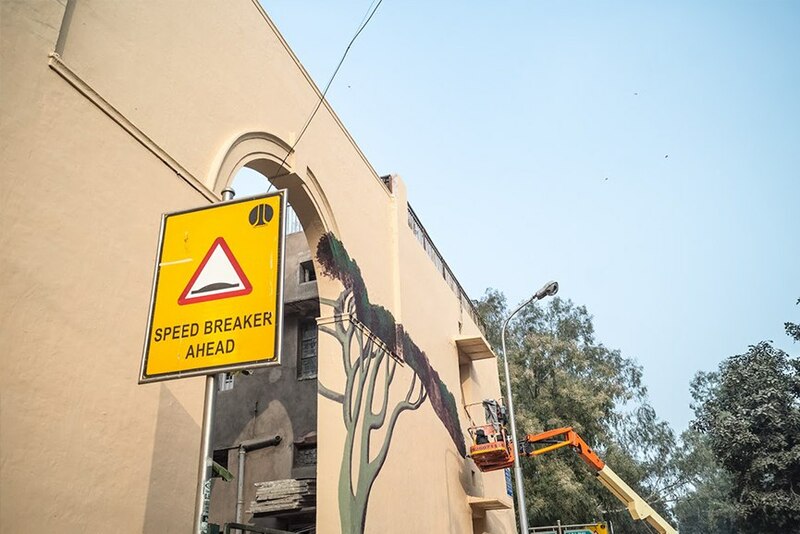 Amitabh Kumar, or simply Amitabh, could be the next rising star of the global urban art scene, and he is an established Indian street artist as well. His distinctive illustrations tend to capture various states of human condition, and they rely on his unique style that has roots in a refined artistic background, since he graduated from the Faculty of Fine Arts, MSU Baroda. 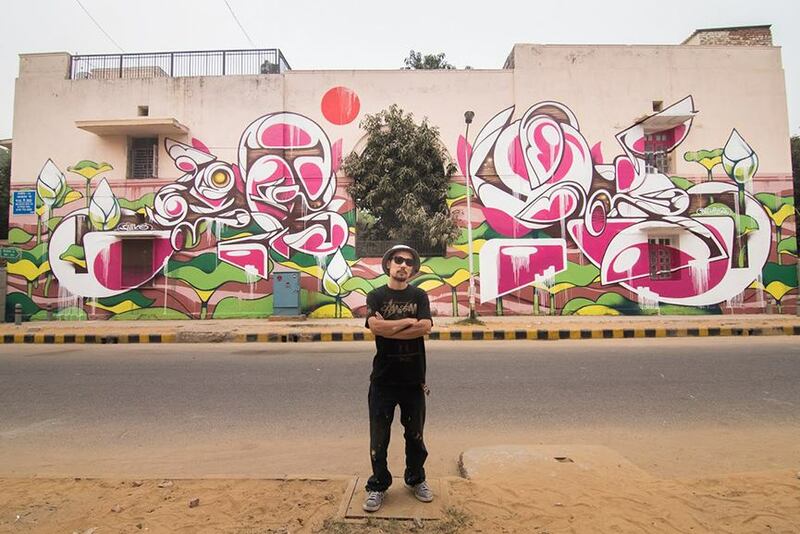 Amitabh is one of the first members of Pao Collective, which is a Delhi-based artistic group associated with comic art. 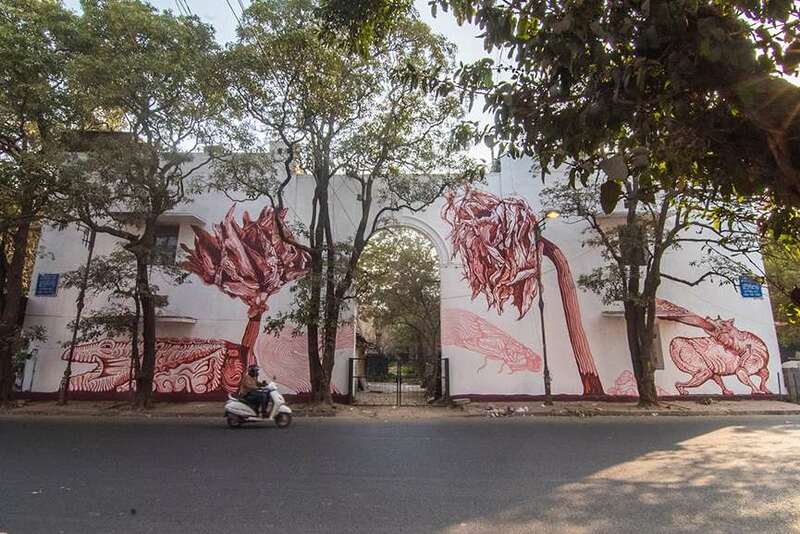 Amitabh’s contribution to St+ART Delhi is a stylized reddish depiction of “Dead Dahlias”, as he entitled the piece himself. 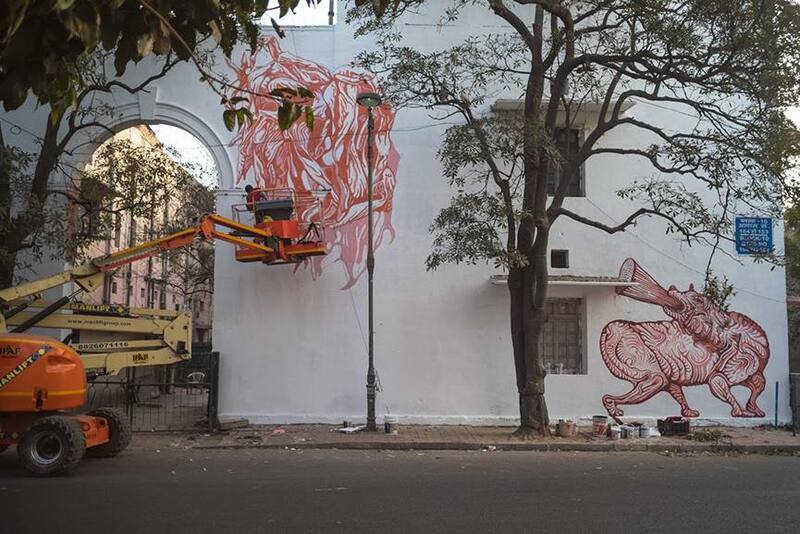 Anpu is an Indian-born artist, who could easily get on the list of the world’s top female street artists. Her signature motive is a cat, and she is famous for stencils, murals and sketches of cats, which she has been making all over the world. 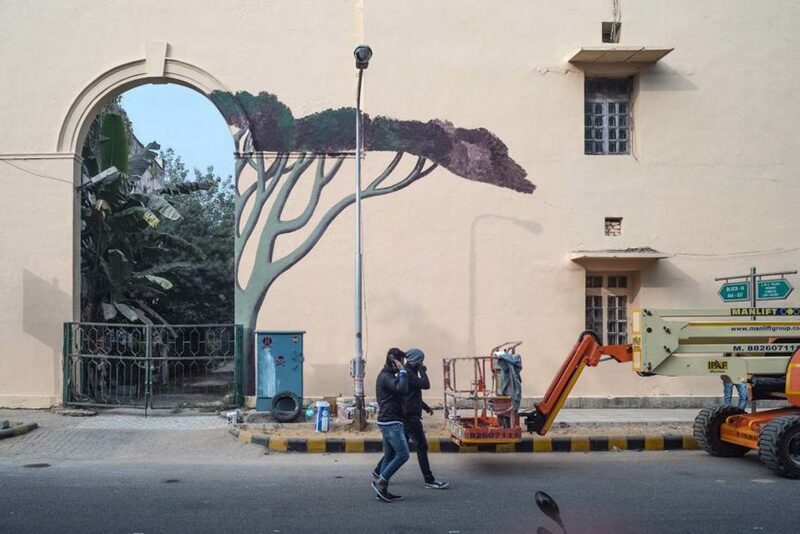 However, her mural for St+ART Delhi festival displays a tree, and thanks to the photographers Naman Saraiya and Akshat Amitabh we can see two phases of the piece. At first the tree had a skinny, unfinished top (and it is true that this version was beautiful as well), but in the end it turned out to be an astonishing mixture of warm, pastel colors. 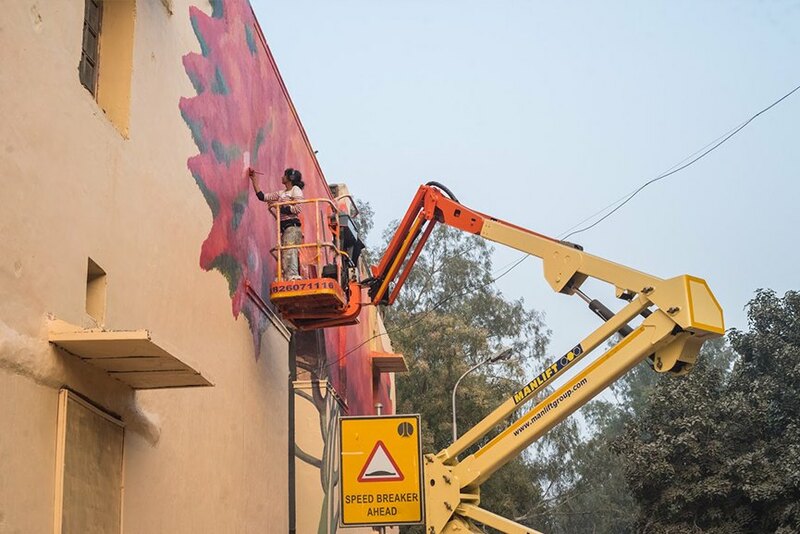 The amazing Spanish artist, who has painted on a vast number of different surfaces, each of which is more interesting than the other, made one of his astonishing murals in Delhi. Two rows of columns extend along the lines of an illusory perspective, and vanish somewhere in the distance. 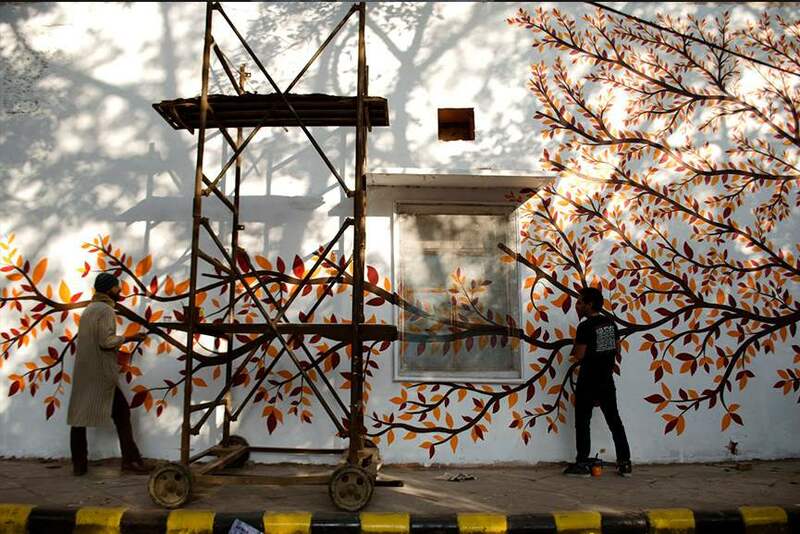 The mural is in a specific relationship with its vibrant surrounding, and it corresponds with a large tree whose top embellishes the wall. 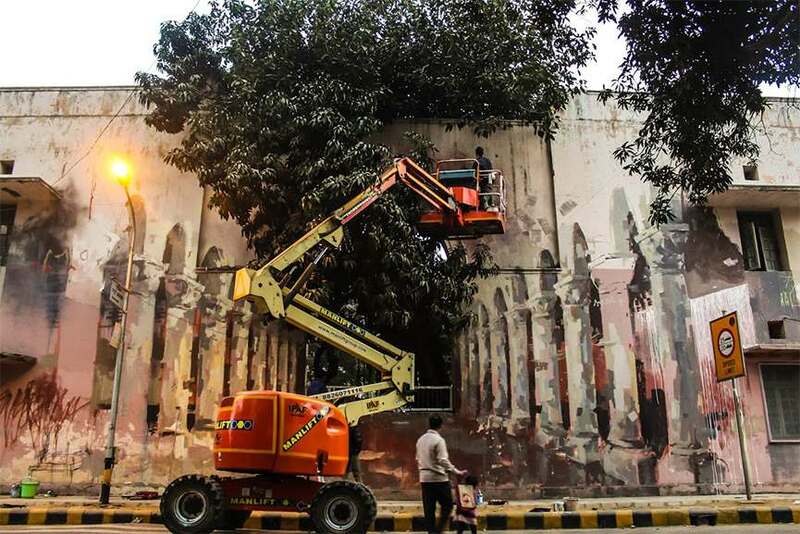 The mural is representative of Borondo‘s authentic style, and it is actually hard to tell where the painting begins, since the shapes and colors are similar to the features of the rustic wall that the mural is painted on. The rebellious French artist Chifumi describes his style as part of “the violent aesthetic of the street”. 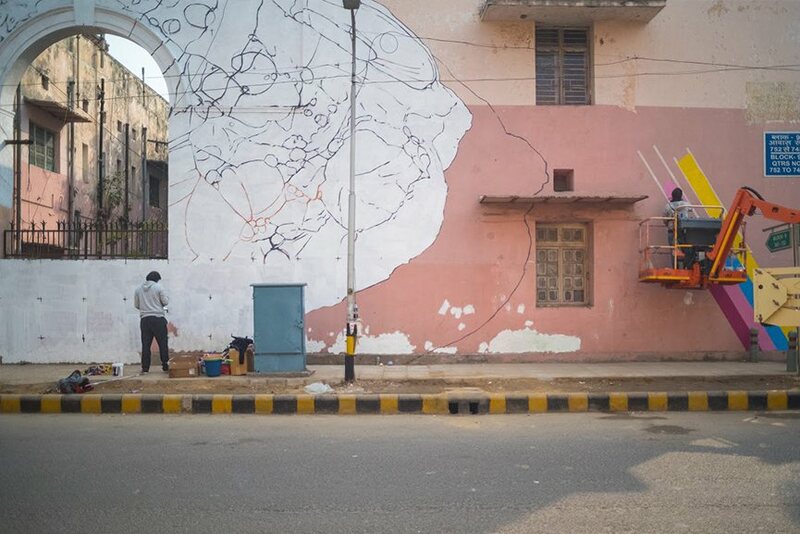 His depictions and designs are made for urban landscape and are also inspired by it. The subject that he deals with, very often, is a hand. 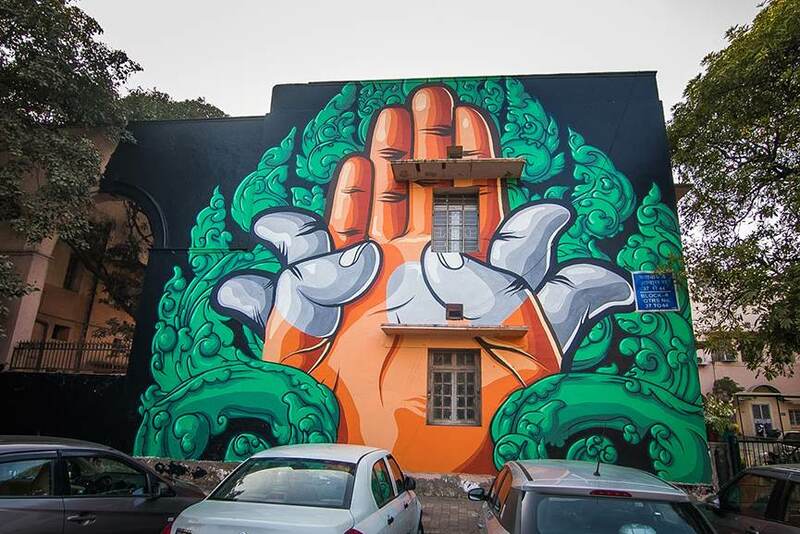 We have a chance to see his hands everywhere, and now in Delhi, India as well. Chifumi’s characteristic hand overlaps with an orange hand that stands in a straight position, and this could be the artist’s own interpretation of the Padma Mudra (gesture of the lotus). 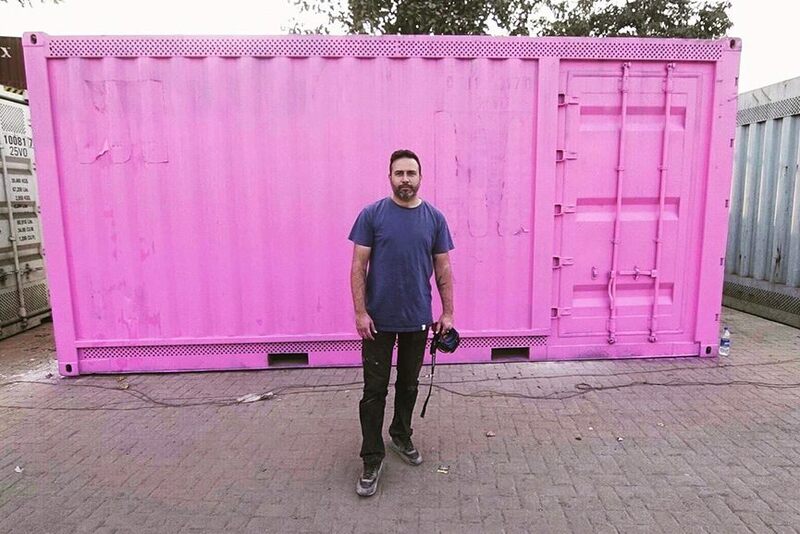 NeverCrew was mentioned in our most recent edition of Street Update, and the work presented in the article was related to the festival. This piece is another commission by the brilliant artistic group, and it is probably one of their most effective murals ever. 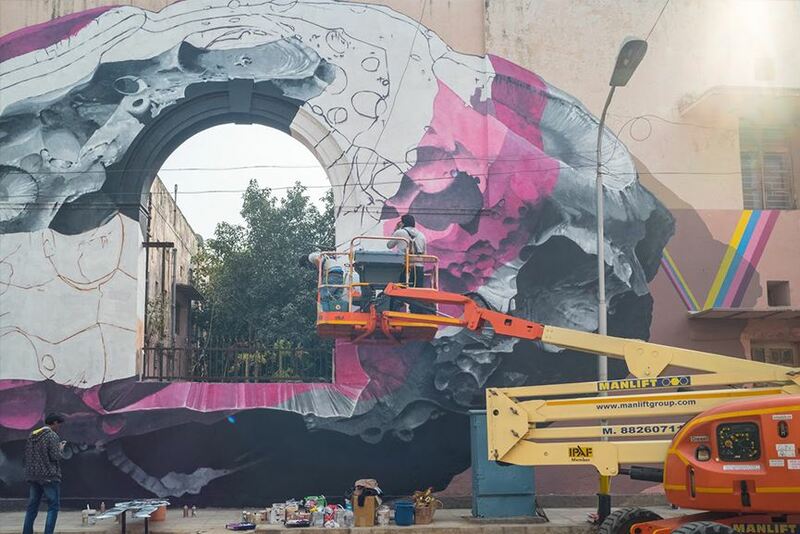 The original color of the wall matches the colors of the mural perfectly, but also the mesmerizing shapes and a combination of different artistic approaches make this piece enchanting. 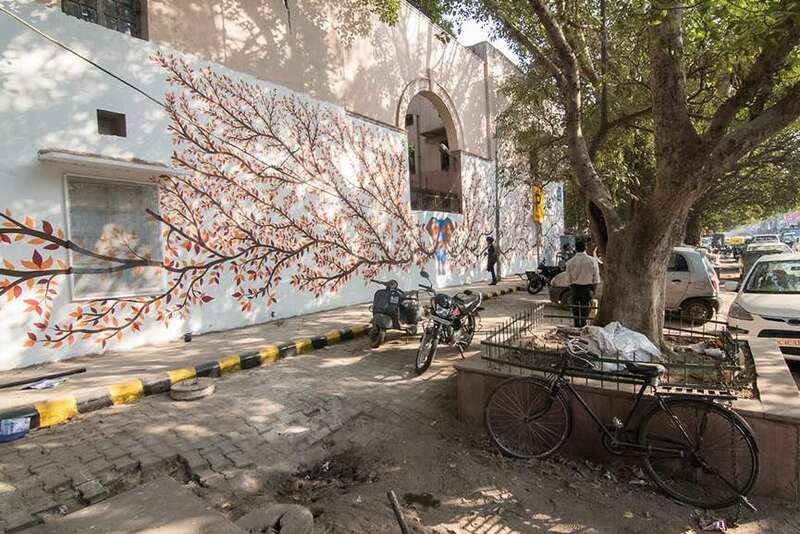 A large particle of stardust is illustrated on the wall of Lodhi Art District, and its surface is represented as a collage of different materials. 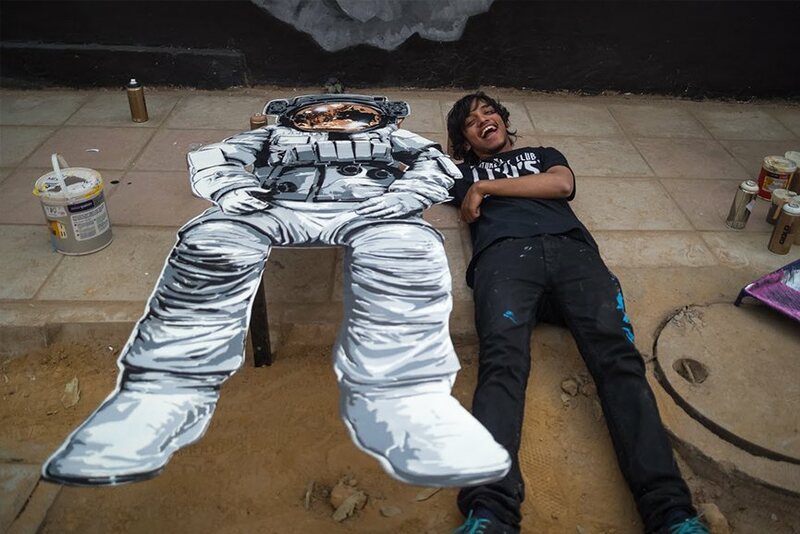 The final touch is added at the top – a printed astronaut observes from above. Rakesh belongs to the Gonds, which is one of the biggest tribes of central India. The word “Gond” apparently comes from kond which means the green mountain. 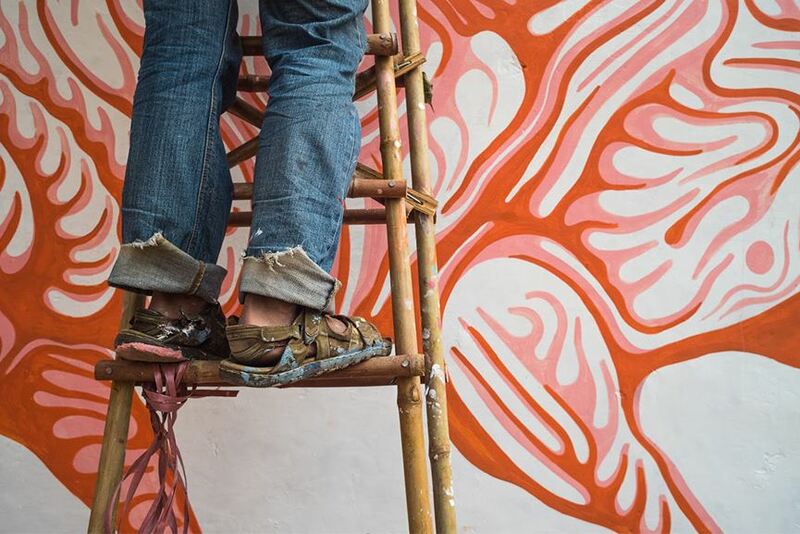 The interesting thing about Gonds is that they traditionally paint their walls with vibrant depictions of local flora and fauna, and sometimes represent their gods and goddesses. In general, the idea is to reflect on man’s relationship with nature. 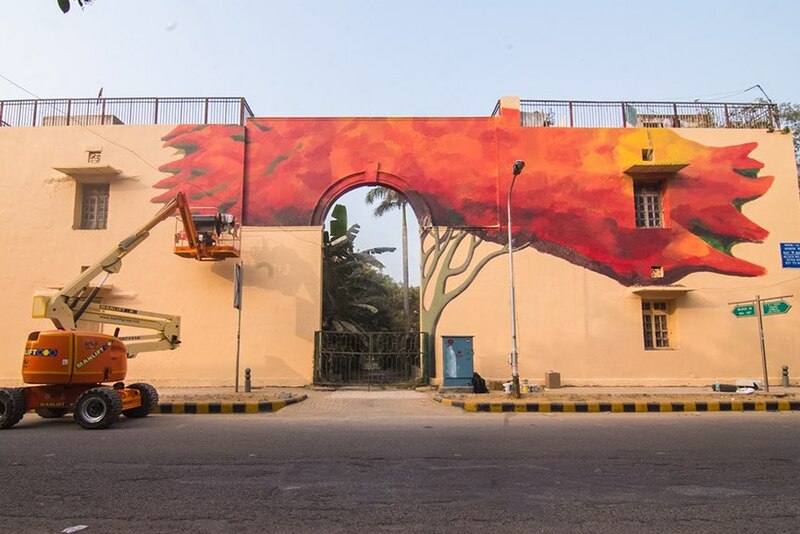 Rakish took part in the festival and made a beautiful mural that not only resonates with his own tradition, but also plays with the shadows of the real, existing flora from the surrounding. Niels Shoe Meulman is a prominent artist and a painter from the Netherlands. 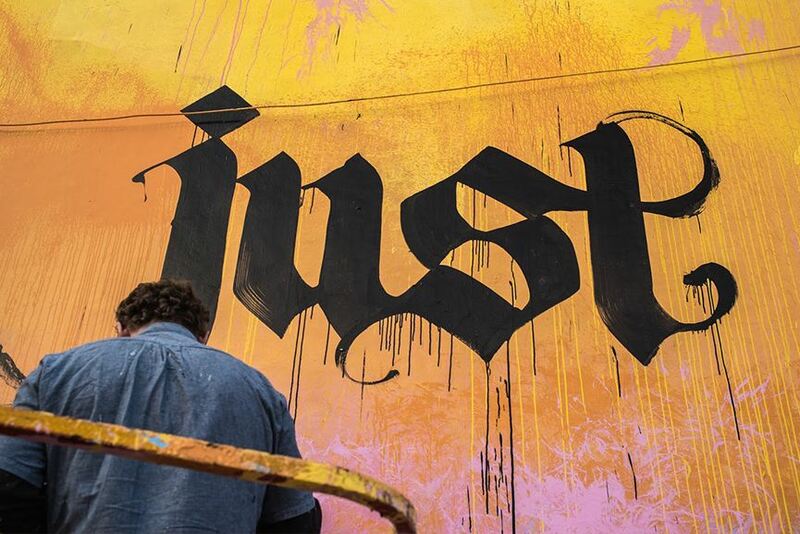 His visual style is based on calligraphy, and he has developed his own typography that is inseparable from his works. 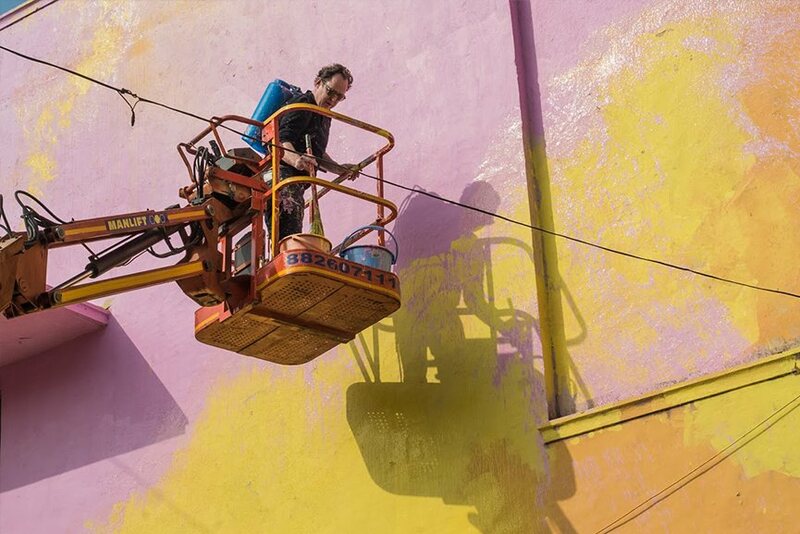 His works often include the use of brooms, which is not that common among street artists. This time, Shoe was using Indian brooms, not available outside of India, and he made an interesting haze of soft, warm colors. 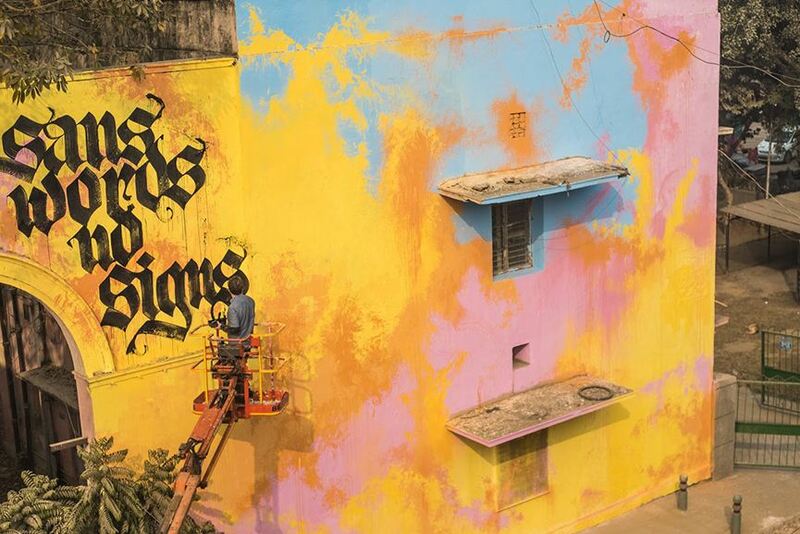 The whole wall looks like an embodiment of a dream, and the writings on the wall look like the lyrics to a street-art anthem. 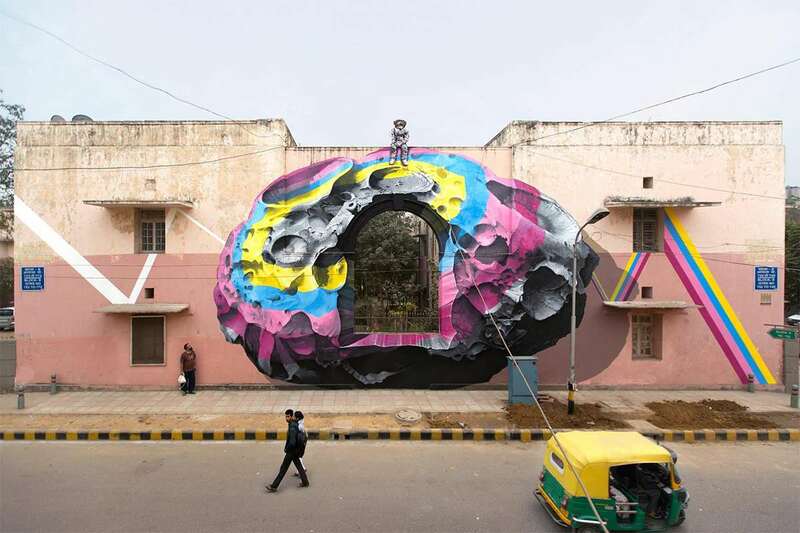 The Indian visual artist Harsh Raman made several murals for the festival, but this one has obviously caught the attention of many visitors and locals. The funky edition of a Hindu guy is very visually arresting and humorous at the same time. His face and torso are displayed on two separate containers, and the third one, which stands beneath them, is open and can be entered. Harsh Raman represented a strange yogi in the interior of that third container. 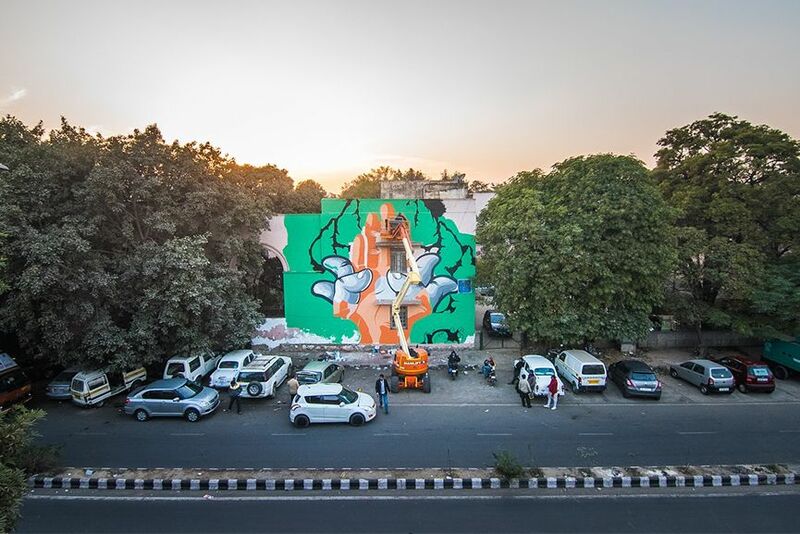 The artist interprets Indian traditional motives in his own way, and claims to use street art as a medium of self-expression. Reko Rennie is a contemporary artist from Australia whose bold, sharp shapes and forms reflect on his apparent “search for Aboriginal identity”. He often uses geometric patterns that represent Kamilaroi (Indigenous Australian Murri) people, and through these interesting repetitions Rennie provokes thoughts on contemporary expression in relation to his own interpretation of tradition. 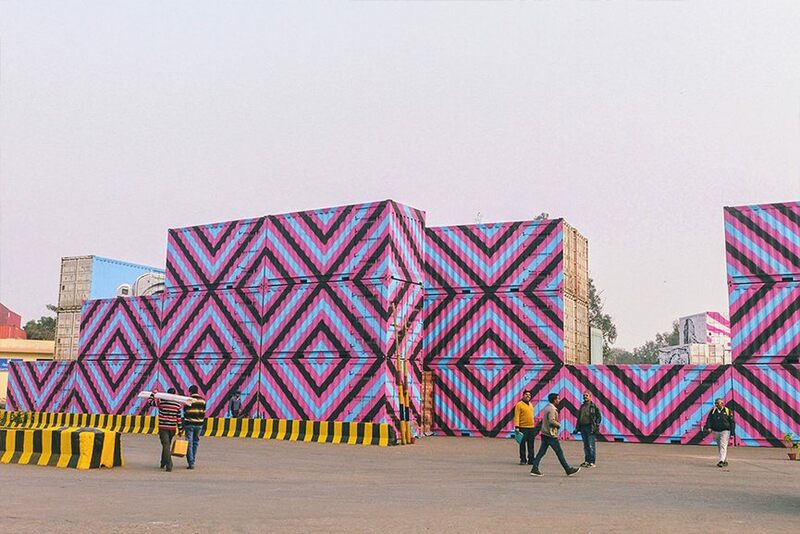 Neon-like and pastel colors combine into a psychedelic set of straight shapes, which the artist applied both to the walls of Lodhi District, and the shipping containers of the Inland Container Depot (ICD) in Tughlakabad. Suiko is a Japanese graffiti artist. The city that he grew up in, Hiroshima, had major influence on him and his overall artistic approach. 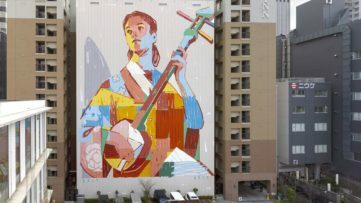 It was the base for most of his activities that related to street art in any way, and consequently the things that he had practiced in Hiroshima are now spread worldwide. 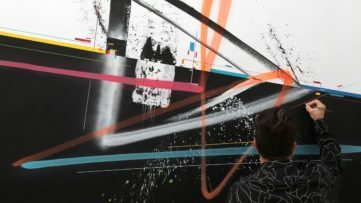 His works often feature “bubbly” shapes, that generate his own language of expression, for which he is becoming famous not only in Japan, but across the globe as well. The exotic touch of vernacular Indian architecture and Japanese street art provides a very original, outstanding visual experience. 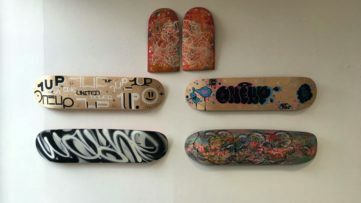 Learn and Skate to Build a Cultural Center in Mongolia – And You Can Help!